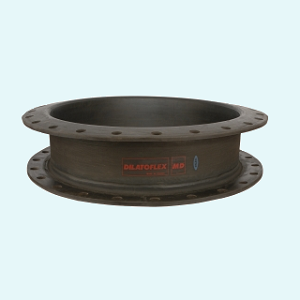 - full rubber flanges, hence secure sealing to pipe flanges. 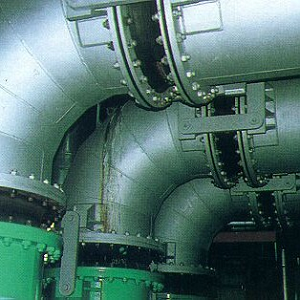 - metal one-part retaining rings behind the rubber flanges, hence secure sealing. 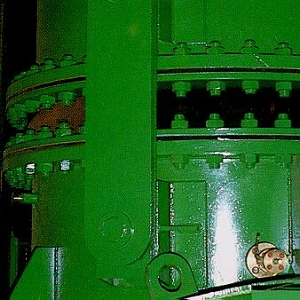 - cylindrical rigid part between convolution and flange, hence low stresses in flange. - cylindrical rigid part between convolution and flange, hence low stresses in convolution. 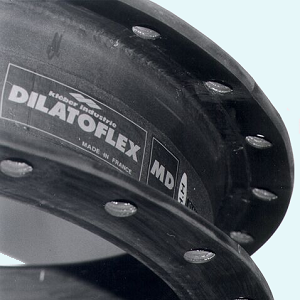 - low stresses in rubber, hence long lifetime. - high safety factor in design, hence long lifetime. - rubber qualities, many choices, see table below. - quality rubber, hence long lifetime. - fabrication length variable, see table below. - hot dip galvanized steel retaining rings drilled PN10, other materials and drillings on request. - pressure resistance, see table below, at maximum temperature at maximum capacity to take expansion.